Set the standard for clean, litter free facilities by offering 360 degrees of hands-free disposal with the 36 gallon Jackson Series trash receptacle. 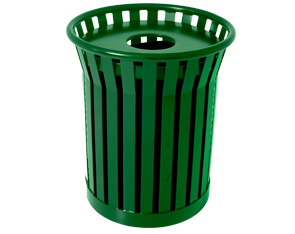 Versatile, durable and complementing, this round receptacle is developed utilizing an all-steel construction featuring a traditional vertical slats and a modern flare top design. The flat top, ash urn and rain bonnet lid securely attach to the receptacle base, conveniently concealing waste held by the ridged plastic liner. Built to withstand conditions in any environment, the MIG welded, powder-coated Jackson Series is great for a variety of spaces including building exteriors, parks and community centers.